Valerie Hegarty, Ghost Ship (Small clipper ship) with Chinese wallpaper (Flood Damage), 2012, canvas, stretcher bars, acrylic paint, foam, glue, paper, sand, dimensions variable. Valerie Hegarty’s “Altered States” is a faux-historic collection of Ameri-ephemera that has been flooded, degraded, and more or less loved to death. The foam core replicas of replicas on view send a very clear message: What may at first seem like heavy-handed irony is in fact a humorous and tender gathering of deeply familiar objects and experiences. Take, for instance, the decapitated Washington portrait melting into his surroundings in Headless George Washington with Table (Lansdowne Portrait) (all works 2012). Tracing the co-opted contour of Gilbert Stuart’s 1796 original is at once a gleeful and vulnerable experience; in many ways, Hegarty’s pseudosacrilegious portrait is more approachable and endearing than the original. The show’s standout, however, is startling for the amount of care infused into each barnacle that be-studs its sandy frame: Shipwrecked Armoire with Barnacles is an emaciated wardrobe standing tall in front of floor-to-ceiling windows. 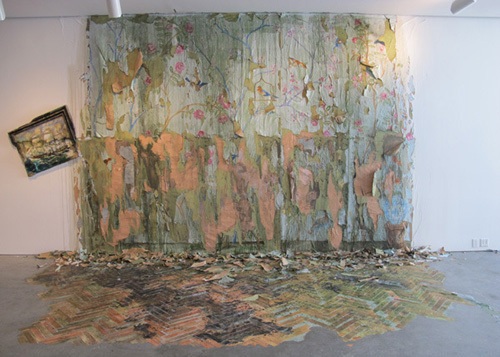 The view from behind the installation affords viewers a fittingly fractured glimpse of the pieces in the gallery, such as the fragmented Rug with Grass, a beautiful replica of an old-fashioned rug, shredded and studded with fake turf and imitation dirt. Flanking the rug on either side are two installations, both sections of domestic views: Ghost Ship (Small clipper ship) with Chinese wallpaper (Flood Damage) and Americana Wallpaper (Fire Damage) with Table. Here, layers of kitschy wallpaper and simulated linoleum or parquet flooring appear as citizens of a culture that has utterly lost its glamour and yet somehow retained its glory.